AluSplash panels are vigorously tested for various aspects of functionality and durability. However like most wall surfaces it is vital that the panel be cared for and maintained correctly to ensure that the panel retains its aesthetic look, color, gloss and surface finish. Failure to comply with these guidelines will result in the product’s warranty to be void. The panel surface must be cleaned regularly. It is recommended that all Alusplash panels should be protected with Vuplex® spray to prevent the panel surface from any micro-scratches or build up of dirt and grime. Use only a soft micro fiber cloth or a non-abrasive cloth to clean the panel surface. Metal pot scrubbing pads or any other abrasive cleaners should not be used on the panel surface. Clean the panel surface with only water, for stubborn stains you may use a mild detergent to clean the panel surface. Do not use acidic, caustic or abrasive cleaning detergents or materials to clean the panel surface. Detergents with bleach or home remedy solutions such as baking soda, or other stain removing gels, powders, liquids or materials should not be used on the panel surface. Stains caused by certain foods and spices such as squid ink, and turmeric can stain the panel surface permanently hence care should should be taken when cooking with such foods and spices. Do not clean the panel surface if it is hot! Wait for the surface to cool to room temperature before cleaning. A 1.5mm gap on each side between the AluSplash Panel and the worktop or gaps between joins of two panels at the corners is required for silicon sealing and to allow for thermal expansion. 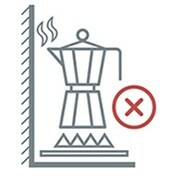 Ensure that the spout of a boiling water kettle is not directly facing the panel surface. 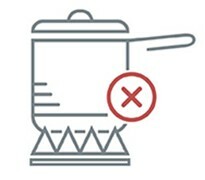 Hot steam, air and/or boiling water released from the spout can cause surface of the panel to be stained or damaged. 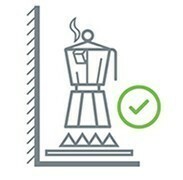 Always face the spout of the kettle away from the panel surface, as shown below. Do not allow the flame from the gas cooktop to spread up the sides of the cooking pot or pan. 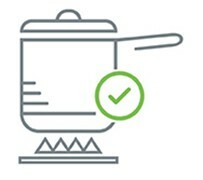 Always place a lid on cooking vessels when boiling any foods or liquids on the cooktop nearest to the panel surface. 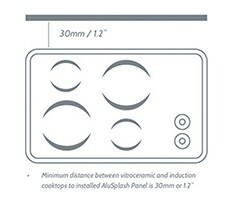 It is important that a minimum set back distance of 30mm between the installed AluSplash Panel and the edge of cooktop is adhered to. Avoid placing metallic or sharp objects like knives and other utensils against the coated surface, as it may cause scratches on the panel’s surface. The above-mentioned Care and Maintenance guidelines must be followed to maintain the panels coated surface and for the warranty to be effective for the period of the warranty. Sign up for our newsletter for the latest interior news and products updates.